Cindy Needham: "Channeling" Vicki Crooms! I was the lucky recipient of a very entertaining email from Vicki Crooms from Mobile, Alabama. I love her story and was also thoroughly entertained by her "naked Barbie dolls" I knew you would fall in love with Vicki too :) and Vicki...what an AMAZING JOB you did on this pillowcase! Beautiful work!!! I am a pharmacist at the University of South Alabama in Mobile, Al. The phrase "bad things happen to good people" was first spoken in a trauma hospital. It can be a stressful job and certainly can be a difficult job at times. But it is a job that can lead to stress. What you do about stress is very important to your overall health. As a stress reliever, I quilt. 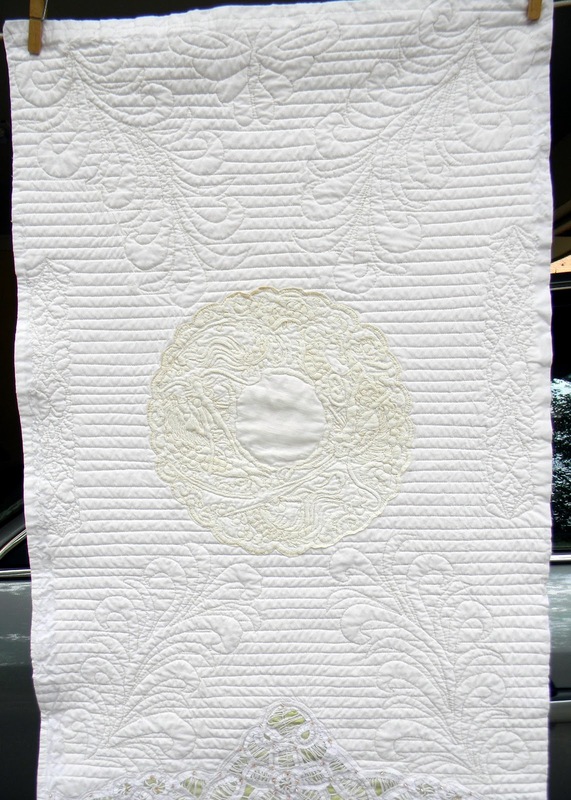 I have quilted since 1983 but officially became a quilting fool about 8-10 years ago, when I got much more involved in my quilt guild, the Azalea City Quilter's Guild in Mobile. I used to work in stained glass and I did make a lot of windows. Stained glass is very similar to quilting in that you take big pieces of something and cut them into small pieces and put them back together. But stained glass is a very solitary endeavor, and was occasionally bloody, so I started quilting. Quilting is the perfect activity. You can quilt in the middle of the night or in a group. I often buy quilt tops that ended up in antique stores. They seem so sad and incomplete. Nobody loves them anymore. They are always hanging beside the pile of naked Barbie dolls. (Every antique store has a pile of naked Barbie dolls. I don't know why). A lot of my quilts have a vintage quilt top on the back. I like the idea of "finishing" the woman's quilt, made so long ago. 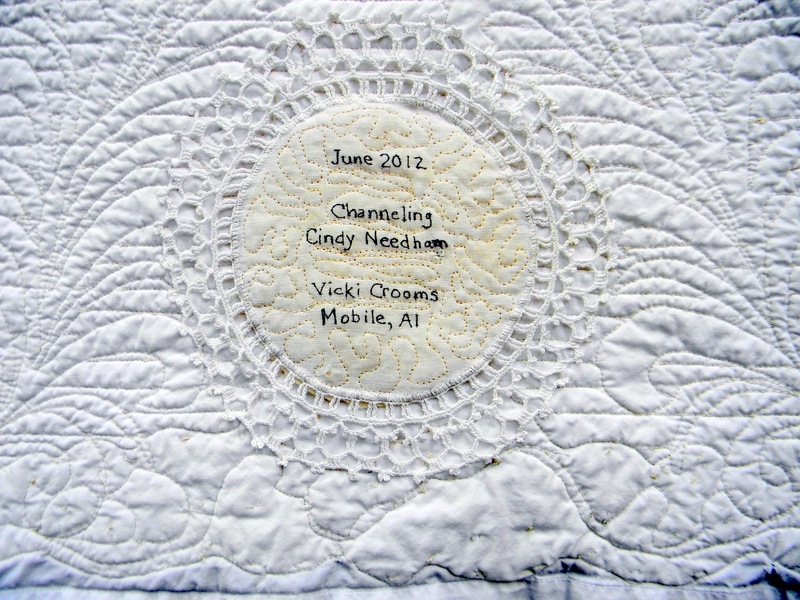 I first saw Cindy Needham's quilts when she was a guest on The Quilt Show online. What a great way to re-purpose the beautiful linens and laces of long-lost women? 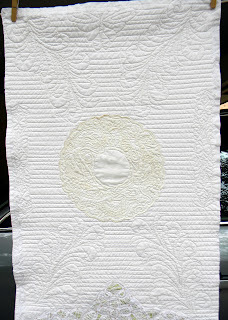 I know a lot of quilters, and basically all of them collect random bits of linen or lace. But what do you do with all those pieces we collect? They pile up in drawers or shelves at home. If you had Barbie dolls at home the vintage linens and lace would be right next to them! Cindy has come up with a wonderful way to preserve these vintage pieces, and to bring them out into the light so we can all look at them and keep them alive, because they are beautiful things. The old saying "they don't make them like that anymore" couldn't be more appropriate. So I started looking for her book, "Wholecloth Linen Quilts" and found it was out of print. Why wasn't I smart enough to buy the book in 2007 when it first came out? But I recently bought Cindy's downloaded version of her books, had them bound for $4 and studied them thoroughly. A whole new way of quilting has entered my life. And, for once, instead of using just the fabric I have purchased and stacked neatly on my shelves, I dug into the drawers containing the vintage linens I had collected over the years and looked at them in a whole new way. And, like the quilt backs I often use on my own quilts, the work of someone else is now part of my own quilts in an entirely new way for others to see. How neat is that? I just completed my first pillowcase quilt and had a great time making it. It was fun. I can tell I'll go crazy making these things! And I will make more. Probably a LOT more! 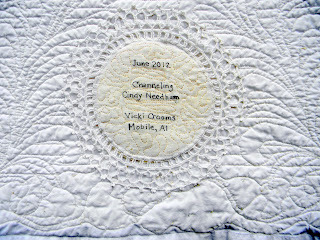 I predict I will have several ready for my guild's next quilt show in 2013! Congratulations Vicki. I really enjoyed your article on Cindy's blog. So cool. Love it, naked Barbie dolls and all! There are about 2000 of us channeling you this month on the SewCalGal FMQ Challenge - thank you! Left over stained glass in my basement and some naked Barbie dolls to....oh, to channel you Cindy, that is a dream of mine! Thia is too fun -- what wonderful comments on life and quilting -- here's to all the naked Barbies in our pasts! Well, sometimes we have to make our own fun down in Alabama, in between hurricanes and oil spills . . . at least until college football starts again.